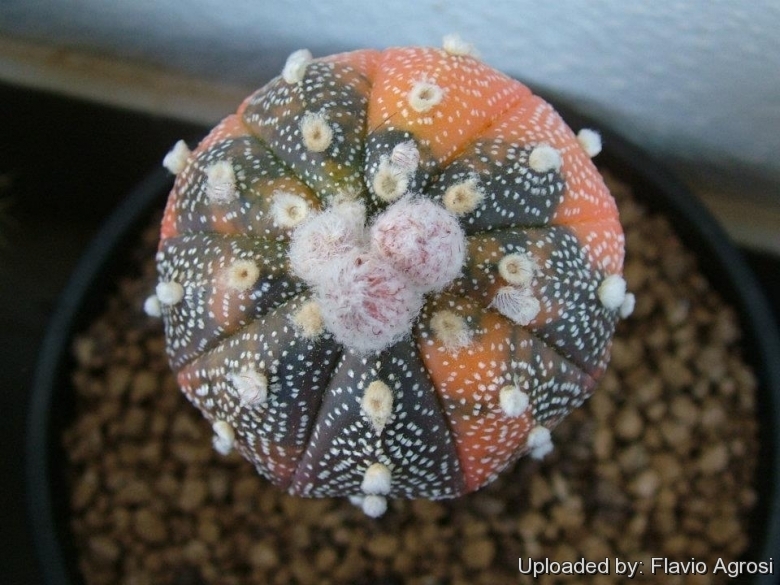 Description: The classical Astrophytum asterias (a.k.a. Sea-Urchin Cactus or Sand Dollar) has an extremely flat stem with unique and remarkably beautiful form and no typical covering of spines, but with tiny speckled tuft of hairs less than pinhead-sized. It produces large yellow flowers with orange throats often larger than the plant itself. Orange variegated form: The variegated cultivars “Astrophytum asterias cv. Nisiki (orange)” has sectors, patches or stripes with distinct shades of orange or pinkish-red. A very few variegated plants sprout unpredictably time by time among normal green seedling and are very rare. Plants with variegated stems are often attractive and highly prized.